Taste test: These are hexagon-shaped cheese tortilla chips, the same genre as Doritos, except in a different shape. They're good! The main reason they're good is that they've got hot peppers in them for a hot aftertaste. 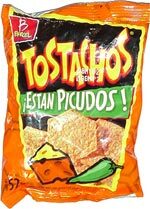 Doritos used to have an even hotter flavor called Salsa Verde, but they discontinued it. 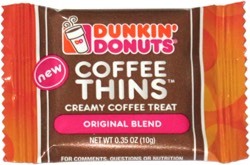 Still, these are moderately hot and very good. The second reason they're good is the hexagonal shape: It's the first time I've ever seen tortilla chips shaped like this. The wide 120-degree angles on these seem like a safer thing to put in your mouth than the sharp 60-degree angles on Doritos. Smell test: Smells kind of like Doritos, but more toasted.